Living with diabetes is all about managing your blood sugar levels. This is a chronic illness, but you can live well with it if you manage it. A huge part of that management is diet. Several lifestyle factors can affect your well-being as a diabetic and your blood sugar levels, but what you eat on a daily basis is one of the most important. Eating healthful, balanced meals can help maintain a steady blood sugar level and smoothies can be a part of this balance. There are even some recommended superfoods that are particularly good for controlling blood sugar and they all work well in smoothies. Of course, it is important that you discuss any lifestyle changes, such as your diet, with your doctor. Diabetes mellitus is a group of diseases characterized by high blood sugar, or glucose. Most common are type 1 and type 2 diabetes. Type 1 diabetes is sometimes called juvenile diabetes because it is usually first diagnosed during childhood. If you have type 1 diabetes, your pancreas doesn’t make insulin, the hormone that regulates glucose. In a healthy person, the pancreas releases insulin when blood sugar levels get too high. The insulin goes to work lowering the amount of glucose in the blood. Type 1 diabetics need to inject insulin regularly to maintain a normal blood sugar level. In type 2 diabetes, the pancreas still makes insulin, but your body has developed a resistance to it and it no longer adequately lowers blood glucose levels. Type 2 diabetes is sometimes called adult-onset, as it is rare to develop in children. In adults type 2 is the most common kind of diabetes, accounting for around 90 percent of all cases. It develops in stages and can be prevented or even reversed with proper lifestyle changes, including diet, weight loss, and exercise. Type 2 diabetes is strongly associated with obesity. Eating right is a huge part of managing both type 1 and type 2 diabetes. If you have either you should work with your doctor or a nutritionist to come up with a proper diet and to make sure you are eating the right foods and avoiding the wrong ones. Because diabetes is all about blood sugar levels, what you eat is crucial. The foods you eat, when you eat them, and how much you eat, all contribute to your blood sugar. A meal plan that keeps that level steady and normal is ideal. Nutritionists and dieticians use several different techniques for helping diabetics plan their eating. There is the plate method, which involves dividing your meal plates into sections containing appropriate foods: half of the plate is for non-starchy vegetables, one quarter is for grains and starches, and the other quarter is for protein. Another strategy is carb counting. Carbohydrates are a source of glucose in your diet, so by keeping track of and limiting how many you consume each day, you can control your blood sugar. A general rule is to stick to 45 to 60 grams of carbohydrates per meal, but the correct number for you may be different depending on your personal needs. With the carb counting method, you are also encouraged to include healthy fats and lean proteins in every meal. As a general rule for living with diabetes, all nutritionists and doctors agree that balancing healthful foods is important. Aim to eat a balance of vegetables, fruits, whole grains, and lean proteins at every meal. Avoid foods that are high in sugar, processed foods, and those made with refined, white grains, instead of whole grains. These foods can cause a dangerous spike your blood sugar. Another way to avoid foods that will cause your blood sugar to spike is to consider the glycemic index. This is a rating that describes the effect a food has on blood sugar. The higher the rating, the more that food raises your blood glucose level. You don’t need to avoid high-glycemic index foods altogether, but you should limit them and eat them with foods that are rated lower to balance them out. While diet is the most important lifestyle factor for managing diabetes, there are others. First and foremost is simply making the commitment to manage your chronic disease. Those who are careful about diabetes management are much less likely to develop complications. Managing the disease means making healthy lifestyle choices, but also seeing your doctor regularly. For lifestyle habits, in addition to a healthy diet, you should also be getting regular exercise. Exercise and losing weight can prevent and even reverse type 2 diabetes and helps manage type 1. Experts also recommend that diabetics avoid smoking and drink only moderately, keep cholesterol and blood pressure levels low, and manage stress. If you plan them well, smoothies can be a healthy part of a diabetic diet. In fact, there are certain foods that are great for regulating blood sugar levels and smoothies are a fun and easy way to make sure you eat them every day. According to the American Diabetes Association, superfoods for diabetics are those that have a low-glycemic index rating and that contain important nutrients including fiber, calcium, potassium, magnesium, and vitamins A, C, and E.
Green, leafy vegetables. These are a superfood for everyone, not just diabetics and the darker the green color, the better. Choose Spinach or kale for your smoothie, as they have a mild flavor that you can cover up with other ingredients. Berries. Any type of berry, including strawberries, blueberries, blackberries, raspberries, and more, are great for diabetics because although they taste sweet, they rate low on the glycemic index. They are also high in fiber, vitamins, and other nutrients. Citrus. Another great ingredient for smoothies, citrus fruits like oranges, lemons, limes, grapefruits, are rich in vitamins. Use whole fruits rather than juices to get the benefits of the high fiber content. Nuts and natural nut butters. Nuts are high in fiber, magnesium, and healthy fats. They are also a good source of protein and can help you feel fuller longer if you are trying to lose weight. Use natural nut butters, like almond or peanut butter, or whole raw nuts in your smoothies for creaminess and flavor. Dairy. Yogurt and milk are good choices for a diabetic smoothie. They provide a good source of protein, vitamin D, and calcium. Whole grains. Whole grains are packed with vitamins, minerals, fiber, and protein and they are low on the glycemic index scale. They may not be your first choice in a smoothie recipe, but you can blend them in to add nutrition, a smooth texture, and minimal extra flavor. Whole, rolled oats work particularly well. There are a few other superfoods recommended by the American Diabetic Association, which you may or may not want to try in a smoothie recipe. Beans are great for providing fiber, vitamins, and protein and for filling you up for a long period of time. White beans have a particularly mild flavor, so you can add a quarter to a half a cup to a smoothie to give it a creamy texture. Balance it with something flavorful, like cacao or coconut milk. Sweet potatoes are also recommended for their low-glycemic index rating, high fiber, and high levels of vitamin A. With their sweet flavor, you can make a smoothie with cooked sweet potato that actually tastes good. Here are a couple of smoothie recipes to get you started. Each one contains one or more of the diabetic superfoods and is low in sugar. Remember when making your smoothies for a diabetic diet that you should avoid added sugar. Let the natural sugars in these ingredients be the sweeteners. Living with diabetes isn’t always easy, but if you are careful to manage your chronic disease, you can live a normal life with minimal complications. Diet is an integral part of that management and smoothies can help you fit in more of those superfoods that will help regulate your blood sugar. For more information and another take on this topic check out Tracy Russell’s (of Incredible Smoothies) article on Green Smoothie Recipes for Type 2 Diabetes. 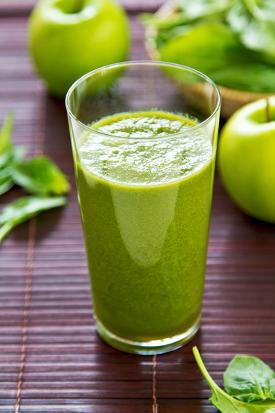 There are a number of smoothie recipes that diabetics have submitted that are working for them. Click here, to check it out. If you or someone you know has diabetes – what has worked for them? Please leave a comment below with helpful information and/or questions. I use you website with almost all my patients. I find that utilizing nutrients by making smoothies can only assist in our struggle to maintain or obtain health. Thank you & your readers for making nutrition a little easier !! Could you tell me more about the use of sweet potatoes (raw vs cooked) in smoothies? From a nutritional standpoint cooked verse raw sweet potatoes are pretty similar. However, cooked are easier to digest and taste better (IMO). Raw sweet potato probably doesn’t blend as well in a smoothie. Can i use regular milk instead of almond milk ? Also can carrots be added? I was thinking of spinach, carrots, banana, avacado, greek yogurt and regular milk. Please advice. I also drink lemon water first thing in the morning and rest of the day. Thank you for info on ingredients for healthy green smoothies for diabetics. Drinking lemon water -What is the value behind it. Why do you drink lemon water In the morning? Lemon water first thing helps flush your digestive system and hydrate you. The vitamin C in lemon juice is good for your immune system. Drinking water first thing is important, adding lemon increases the benefits. My husband is a type 2 diabetic and I am hvng trouble finding a balance with the fruit and veggie smoothies to effectively hlp bring down the nmbrs wn blood sugar is checked an hour or two later.He is constantly staying in the high 150’s to 190’s range. Wht are we doing wrong? I’m trying everything that I can think of. He loves them and I am even doing them with him.I’m not diabetic but figured they would be good for me also. I am drinking veggies that you couldn’t pay me enough money to eat and am actually loving them! Maybe I’ll lose a pound or two since I am on steroids daily. Please advise! Without knowing exactly what’s going into your smoothies I would venture to guess that you’re including too much sweet fruit. Try following the guidelines in this article for a couple of smoothies and see if there’s improvement. If you post an exact recipe or two I can critique. Hi Ryan, Love your site, just what I need for inspirational smoothies. I am diabetic (T2 no medication at the moment just low carb high fat diet) and I notice a lot of your smoothies with nutritional information seem very high in carbs? I would like your book too please but I can’t see where to add email address for it. When it says “below” does it mean here, i.e. if you reply you get it? Thanks for all the information you have included here which is mega. I’ve heard that concern before. What do you consider high in carbs? In the confirmation email that you received there’s a link to confirm – click that link and you’ll receive another welcome email with download instructions for the book. I need to watch carbs & sugar, I have a Fatty liver so I am concerned on what smoothie recipes I can make. I had a smoothie with mint, banana, avocado,ginger, spinach, kale, strawberry and blueberries but I used the juice of cucumbers, pineapple, tomatoes and celery. Does it sound too much for a diabetic smoothie? Please advise. Btw thank you for the link. The amount of sugar in that smoothie is borderline too much for a diabetic, Fransisco. Either omit or only use 1/2 banana and you should be fine. If that’s all going into one smoothie it’s a bit high in sweet fruit and therefore sugar. Try 1/2 banana and only 1 kiwi. I love your website… passing it on to several friends of mine. I accidently found your site while looking for smoothie recipes for a friend who has Type 2 diabetes. I find your information very helpful…!! I’ve been making smoothies for my husband who had a stroke 3.5 yrs ago… he lost weight & is healthier because of the smoothies I made. He went from 263 lbs to 190 lbs. all over a period of 3 yrs.! The blueberries I put into the smoothies are beneficial to help with memory… stroke was caused by a blood clot on the brain. Losing the weight slowly over a period of time was good for him… PORTION control eating was something he had to learn to do…! Thanks again for your informative website!!! Great to hear about your husband’s success with smoothies! I just saw a recipe and was wondering if it’s ok for a diabetic. Hi Dez. That’s a going to be a bit high in sugar from the apple and banana. Try it with 1/2 apple and 1/2 banana. I am a Type 1 Diabetic. Rare of getting this at age 35 and not over weight. I was a gestational diabetic and when my son was born it never went away. Anyway, I have a smoothie of 1/2 banana, Kale or spinach leaves or both, raw brown organic egg, water, ice and broccoli and a pinch of raw almonds. It is actually good and without all the fruit which is a lot of sugar. You can put any thing in a smoothie, just watch the sugar amount. The almonds adds more protein. Thanks for the information on your site, most useful. I use Maca powder (raw) in my smoothies to provide a protein boost to help with the lower energy levels caused by type two diabetes. I also use a probiotic drink to help maintain balance in my digestion, not daily but about three times a week. Additionally I use only two fruits and coconut milk (So Good) and water my smoothie down with coconut water. Very tasty not too sweet and helpful beyond belief. PS The Maca also aids my issues with prostate problems. Very good, David. Thanks for sharing what’s working for you so others can benefit. You might try regular water because coconut water is so high in sugar, Lisa. Or a 50/50 mix. Apology for jumping in on another persons post. My dad is 90 years old and on a peg after brain surgery. He has been neglected at frail care. He is only on protein powder mix. Please I need to get him to have vegetables, meat and nutritional feeds. Taste and flavour is not a problem as he gets it through the feeding peg. No worries, Elsabie. I’m not that familiar with feeding through a peg. If he can do smoothies, then blend up a bunch of fruits and leafy greens. Even better, try bone broth (with meat if possible). I would like to try your shakes, my meds give me indigestion. Hopefully my smoothies can bring some relief. Yes, kiwi is an acceptable ingredient for a diabetic smoothie as isn’t not overly sugary, Abi. I can’t speak to the other foods – that’s something to discuss with your doctor or dietician. I’m a Type II diabetic. Is it OK to mix 1 cup of Silk dark chocolate almond milk and 1 serving of Nutiva hemp protein in a smoothie, or is this particular almond milk inappropriate? At 17 grams of sugar per serving I would steer clear of the Silk dark chocolate almond milk. Opt for an almond milk much lower in sugar or water. Hi, I was helped by reading your site comments and your replys. I purchases my smoothie mixes from Dr. Smoothie. I particularly like their Mango Smoothie Mix. They have several different ones to choose from. It has 32 grams of fruit sugar in it, & 34 grams of carbs in it. When I make it in my blender, I use 4 oz of the mango smoothie mix, 2 oz of water, & 6-8 oz of ice. I blend it for 30 seconds, and pour it in an 8 oz glass. It is very tasty, creamy, & smooth. My question to you is, is that to much sugar & carbs to consume in an 8 oz. glass? 32 grams of sugar is on the high end, especially for a diabetic friendly smoothie. I would try to halve that. Same with the carbs. You might try adding an avocado and/or Greek yogurt and using half the smoothie mix. I make a smoothie every morning for the past seven years. For the most part my recipe is kefir (enough to go over the blades on my vitamix), a banana, six strawberries, a dozen blueberries, almond milk unsweetened vanilla (or small dollop of dark chocolate almond milk), two handfuls of spinach, two scoops of collagen peptides, and one scoop flax seed. All organic. All wonderful tasting. That said, on certain days, I feel my blood sugar dropping or spiking quickly. I am not diabetic but act like one given our hereditary condition to become type 2 in our old age. My eating has been preventative. How should I modify this? I used to use protein powder but felt that using the collagen peptides as a protein is redundant so stopped adding it. The collagen give great relief to my joint pain which is no longer chronic given the daily collagen dosage. This makes 2 servings and I spread them over 2 days. Overall, your smoothie looks great and is very healthy, Beverly. Kudos for using only organic ingredients. That said, I recommend you try using 1/2 banana (to reduce sugar) and incorporate some healthy fat into your smoothie, which will slow down the absorption of sugar. Try either 1/2 avocado or 1 teaspoon or coconut oil or ghee. You can work up to 1 tablespoon of coconut oil or ghee. The collagen peptides should cover you on protein. I am going to try your 2 diabetic smoothies soon ,I have some of these ingredients but not all of the ingredients in these 2 smoothies. I have type 2 diabetes that I have had for five years now. can I put these ingredients in my magic bullet? Yes, add the ingredients to your magic bullet and blend away, Kim. I have had my pancreas removed and take insulin twice a day, I have been checking out diabetic smoothies, what do you think of adding spirulina pacifica to smoothies. I need more protein in my drinks. I think spirulina pacificas is a great product and on I’ve consumed in the past, Joy. It will definitely boost protein. You could also try gelatin or a nut butter to increase protein. Tomorrow I am going to buy some ingredients for the green diabetic smoothie and hopefully I can consistently lower my blood sugar naturally. Since I have a tendency to get sick because of my compromised weak immunity I have been in the hospital four times for lengthy admittence until I am better and healthy. I have been sick all day ( Jan.25) and I want to build up my immunity and I was wondering if you can recommend a healthy smoothie that I can use in my blender. Follow the instructions above Amna :) Cut down on the sweet fruit and sugar. Hi,I now have the ingredients to make your green diabetic smoothie,but I don’t have an orange to put in this smoothie. Can I still make is smoothie without the orange in it?I have some vegan protein powder to put in it with stevia to add to it. What else can I add to this smoothie? Simply omit the orange or substitute with any other citrus, Kim. This looks like what I have been looking for. Please send me the e-recipe book for the smoothies. Thanks a lot Ryan!! Check your email for the e-book, Randy. HI,I AM GOING TO MAKE UP THE GREEN DIABETIC FRIENDLY SMOOTHIE ON FEB.28.I DON’T HAVE THE ALMOND MILK BUT I DO HAVE A CONTAINER OF UNSWEETENED RICE DREAM COCONUT MILK,KALE,NATREL MILK,FROZEN BERRIES,AND GREEK YOGURT,WOULD THESE INGREDIENTS BE OK AND FINE TO PUT IN THIS SMOOTHIE? I WOULD ALSO LIKE TO MAKE UP THE OATMEAL BERRY SMOOTHIS SOON.DO I REALLY HAVE TO WAIT FOR 8 HOURS AFTER I MAKE A CUP OF OATMEAL BEFORE I PUT IN THE BERRY SMOOTHIE?CAN I PUT THE FULLY COOKED OATMEAL IN THE BERRY SMOOTHIS WITH THE OTHER INGREDIENTS AFTER IT HAS COOLED A BIT THEN PUT IT IN THE BLENDER? Yes, those ingredients will be fine for a smoothie. You don’t have to do anything I tell you :) If you prefer not to soak your oatmeal that’s your choice. It’s not imperative. Yes, as long as the oatmeal isn’t boiling hot you can add it to your blender with the other ingredients. That smoothie is high in sugar from all the fruit, Victoria. Replace the pineapple juice with water. Try adding yogurt or a nut butter to balance it out. I saw an article where it talked about a green smoothie to reverse type two diabetes . It said, drink this on an empty stomach for five days and it will reverse diabetes. One green apple, two celery stalks two carrots, a bunch of spinach, made this this morning very dry added water drink on empty stomach! My blood sugar went from 100 to 175 and one hour later. I am pre diabetic, I have been controlling my numbers by watching my carbs ! How can I drink a smoothie with low carbohydrates and low sugar ? I would love to have a smoothie every morning for breakfast ! Reversing diabetes in five days sounds like a stretch claim if I’ve ever heard one. The recipes above are low in sugar and carbs; so I’d start there. Also, incorporate some of the other diabetic friendly ingredients into your smoothies. That doesn’t sound like a smoothie high in sugar. Maybe use half a paw paw and see how you respond. WOW! This was great. I think I’ve been following most of the advice you’ve given. I’ve been reading your emails for almost a year. However, I don’t measure. I use berries, apples, walnuts, cocoa, banana, grapes, oranges, water, kefir, almond milk in different variations. For a single serving, what should be the total volume? PS I also loved the dialogue format of this email. I don’t measure either, unless for a recipe I’m posting on my site. There’s no hard and fast amount for a single serving, it really depends on your health goals, activity level, and the ingredients. I tell people to aim for an amount that keeps you satiated until your next meal. That said, around 2 cups. I am a type 2 diabetic. Can I use unsweetened coconut water in my smoothies? Yes, unsweetened coconut water is a good option, Anne Marie. I use 3 large kale leafs, , 3 hand fullsof spinach, 1 cup of blueberries, a half cup of mango,1/2 avocado,and almond milk. Is this okay for a diabetic? Also, I drink 4 a day…and stay away from regular food. My blood sugar is way down. Instead of 13 units of novalog after every meal….I use 5 twice a day on the 2nd and 4th smoothie. Thanks for tour help! And you are a huge help. That smoothie looks like a winner because it isn’t too high in sugar. I don’t advocate smoothies for every meal, but if it’s working for you then good luck with it. Fantastic, Janet! Thanks for sharing your smoothie success. Hi Ryan, I am a brittle diabetic and sort of got it under control. I thought I would try smoothies for one of my meals. I just bought a vitamix blender. Do you have any free low sugar smoothies that I can try. I saw free e-smoothies recipes. Are they low in sugar content? Enjoy reading your replies to other diabetics. Most of my recipes are low in sugar, especially compared to a commercial smoothie shop. That said, some of my recipes are lower in sugar than others. These diabetic smoothies for example are low sugar. For any of my other recipes, if the sugar is too high, reduce the sweet fruit, omit the sweetener, and/or use stevia to sweeten. This is just what I have been looking for. Thank you for the great information! I would like to try your recipes for diabetes 2 and hopefully help me manage my condition. Are they tagged low carb recipes? Or how can I identify the best ones for me? Also, please, send me your recipe booklet. The recipes and advice above are a good starting point. After that, look for recipes that are lower in sugar and carbs and/or modify recipes by reducing sugary ingredients (usually sweet fruit). Just sent an email that you will need to click a confirm link in to receive a copy of my recipe e-book. The site is quite helpful thank you,my husband is type two diabetes and when he was encouraged to loose weight he indulged in exercises that may have consumed a lot of energy . In short his muscles really wasted away and when we visited the Doc he said he should stop those exercises and only do simple ones. What can smoothies can i prepare to help build his muscle s back at least. Is that going to work for me ? That recipe works, Paul. You might try the recipes above as well as incorporating some of the other ingredients for a richer, more nutrient dense smoothie. Read most letters and your reply with interest.i am a borderline type 2diabetic. Please could you send me smoothie recipes that can serve as my breakfast or my bedtime drink. I recommend one smoothie a day, Peter. The recipes above are your best bet. You can also peruse the 200+ other recipes on my site. For those that are higher in sugar, simply remove or reduce the sweet fruit and/or sweetener. I have Type 2 Diabetes. I recently broke my back and cannot exercise. I do like your smoothie recipes. My daughter was helping me one day and suggested adding two scoops of protein powder to my smoothie. Do you think this is a good idea? Sorry to hear that, Nancy. Protein powder is usually a good thing. Try it and see how you feel. I’m a type two diabetic. I manage my sugar by diet and exercise. I have to differ with you with regards to whole grains. Studies have shown that there is no difference in the sugar spike of whole grain breads and white breads. They both spike the sugar the same: way too much. Thanks for pointing that out, Lloyd. I’ll have to double check my sources and potentially update the article. Hi,i have all of the ingredients to make your harvest time sweet potato smoothie and i am going to make your smoothie today and i will let you know what i think of your smoothie after i make it in my magic bullet blender.what do you think of chia seed pudding?DO you have any chia seed pudding recipes on your website that i can make at home? I have coconut milk,almond milk,vanilla almond milk,cocoa powder,stevia packets,choconut shreds,avocados,lime and lime juice,kiwis,dragon fruit,chia seeds,and apples.The coconut milk,almond vanilla milk are in the frigerator. Thank you trying to change my lifestyle. Hi,i was going to make your harvest time sweet potato smoothie this morning but i bought a yam potato instead of a sweet potato.i thought i picked up a sweet potato and when i cut into the yam it was orange like inside of it instead of white.now i don’t know if a yam will be good in your smoothie or if the yam will raise my blood sugar. Ryan,can i still use the yam in your smoothie or just wait until i buy a sweet potato? You can use a yam, Kim. I don’t know what the normal turn-around time is for getting on the mailing list, but I tried this a couple days ago and have heard nothing. So I will try again, because I would really like to incorporate aloe vera into my diet. You should receive an email to confirm your sign up to my newsletter within 10 minutes, typically within 1 minute. Perhaps it’s in your spam folder?